Dala Metallic Fabric Paint is shiny, soft and flexible and will not crack. Available in pearlescent and metallic colours, including classic metallic shades. All colours are completely opaque and thus ideal for dark fabrics. They also have a soft flexible handle when dry and are suited for both natural and synthetic fibers. 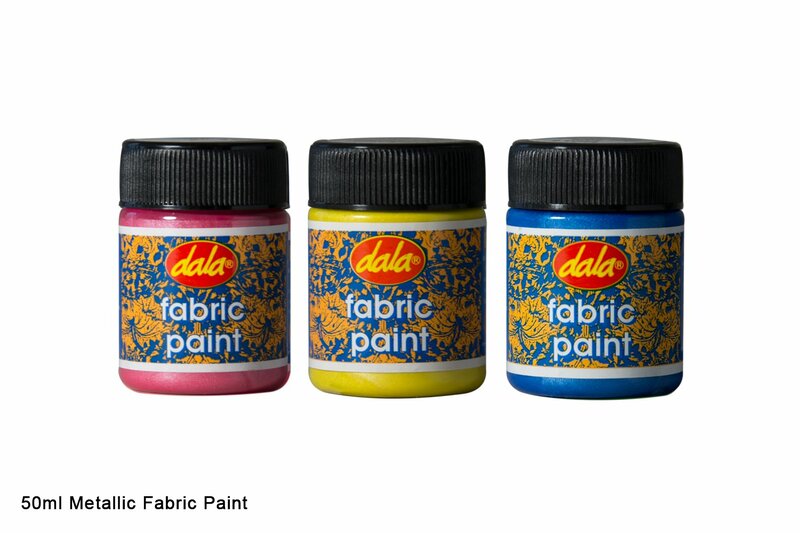 Dala Metallic Fabric Paint is shiny, soft and flexible when dried. Will not crack. For use on all types of fabric. Check out our accompanying Fabric Medium range. Test on a sample swatch to ensure compatibility. Apply paint from the tub, or mix your own colours. Heat set by ironing on the reverse side of the fabric. Set iron to recommended temperature for the fabric you have used. It is recommended that the maximum temperature for setting the paint is 130 degrees Celcius. Garments may be dry cleaned if set correctly. *Clean up using warm, soapy water. This item has 1854 views.